ondervind u die lewe in Duitsland? Visit their site and enjoy local SA content. you stand a chance to win 2X return tickets home. sharing this site with us. pages and re-discover things that are important to me. expenses while furthering my studies through distance education. that might come my way. Kind regards, Elbert de Wit. Johannesburg und bin zufaellig auf Eure Seite gestossen. Braai Events. Solltet vielleicht den "Non South Africans"
erklaeren, was es ist ;-). Viel Spass noch mit Eurem Verein. Macht es gut und an alle ein Frohes Weihnachten aus Jnb. ons beide werk in Ingolstadt. Hoop om eendag saam te braai en almal te ontmoet. Nice Site and what you think about our site? ons op die oomblik, laat my wens ek was op Blouberg strand! inligting sodra ek die Ja-woord gekry het. allerlei lekergoed he om aan te knabber. 180 mense so laat weet maar vroegtydig.....laasjaar was vol gewees. 06171-55383 na 5 elke dag. Julle kan na laasjaar se fotos kyk en sien wat ons almal gedoen het. Ek sal graag n masker party wil hou, Maar ek kort n theme. bang, hy verstaan mos niks nie. Hy kan al n paar woorde se. die 23 Sep. Watse masker party? aan biltong moet hy nog gewoond raak... Wie is almal? party maak?Pa verlang baie.En leer die Duitser AFRIKAANS!!!!! Lekker om te sien julle kan nog vleis braai. Kathleen & Duitser sien julle September. Any South Africans here today??? kan iemand asb vir my skryf. ek bly in Mengkofen by Dingolfing. home for 4 weeks because I'll be turning 21!!! can't wait!!! pap en boerewors hier kom ek!!! This is website I really like. Well done. their annual pod from South Africa! people living in and around Munich. I'm a Capetonian. Ek soek graag antwoorde ! 1.HOE VEILIG IS 1080sodium monofluoroacetate VIR DIE MENS ? 2.IS 1080sodium monofluoroacetate WETTIG IN SUID AFRIKA ? EN HOEKOM IS HULLE NIE MEER NIE ? SY NOG DAARVOOR WEES ? EK HOOR SPOEDIG VAN U ! (preferably Springbok or Kudu). Do you have any suggestions? however, plenty of opportunities to have a few cold ones. around the world but proud and loyal to our country. have created our world leading Constitution and way of life. you! Best wishes and good luck to you and your guests. take us up on the offer above. watch the rugby, cricket and have a few quite cold ones???? would be interested in our gift service. presents for South Africans living overseas. hesitate to contact us or visit our web site www.egifts.co.za. springboka are in the Munich area. SKOP. Please vsist our SKOP website. similar aged ladies out there with similar aged kids?? Business Directories, Clubs, events, jobs, etc. Seither stöbere ich ab und an auf Eurer Website. Clegg am 22. Juli 2005 in der Muffathalle spielt. Moved to Germany for a girlfriend. Now living in Mainz, if you are near please make contact. I moved to Germany on the 16th December last year to get married. I live in Trebur near Wiesbaden and Frankfurt. Please supply me with an email address as I have a proposal for you. Hi everyone, I know it is late but thanks for a "moerse"
By die huis se kant. are always in my caring prayers! country folk, just made my day. lekker om julle almal te ontmoet en ordentlik fees te vier. Sterkte vir almal van julle vir die toekoms! gerus as julle in London kom. was wondering if their are any other Saffies in Frankfurt/m. so happy I found this website, especially when home sick. system in Germany is very different. love to bounce some ideas off you! Great site...have been lving in LONDON now in Germany. BILTONG !!! becoming weell known abroad...lekker!! 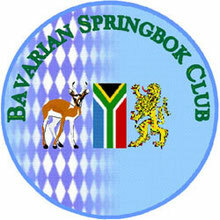 HOWZIT to all members of the bavarian springbok club. community of South Africans in Münich. I'm trying to set up something familiar here in Stuttgart. und came to Germany in 1973.
here in the south side. contact us by email, or order on line. We supply good product, good prices, honest and reliable. in Garching and is agreat place. NOw living in Auckland NZ. Almost a citzen too! Good luck to you all. looking to meet other South Africans. having foreign blood!!!! Who Knows!!!! Thanking you for allowing me to express my feelings!!! multi jurisdictional offshore structure, we can help. guaranteed by the Constitution of the Republic of South Africa. Peter here from all the way over in Dublin. serious extra euros part time or full time, then this posting is for you! success!Germany is actually the fastest growing country to date! I started with them recently & haven't looked back! earning some extra euro, Drop me a line! Camps Bay) and finally I got a place to order some real stuff!!! springbok T - shirt.If anybody knows,please contact me via e-mail. Thanx loads and have a good one. G-E or E-G, please contact me. importers in Germany. Do you have any contacts? experience for me to work 3Years as a chef(cook) in South-Africa. contact me,most of the lokal butcher can make it than for the next braai. called Gross -Gerau, which lies between Frankfurt and Darmstadt. I am so glad to find you. Looking forward to join and meeting people. Hi! Lovely site. I am South African busy studying in Braunschweig. My parents are living in NRW bout 30 kms from Osnabrück. Would love to meet other South Africans in the area. to Cologne.Best wishes to the Bavarian Springbok members. bad but cannot beat the freestate boerewors. Have a good sunday and hope hear from fellow countrymen. Africans living in the Darmstadt-Frankfurt area. to South Africans who I know would love to buy the products. products in Germany as well. Someone mentioned boerewors.....? Hi all. I come from JHB and I'm living in Hausham, near Miesbach. I'm living in Austria, so it seems your club is the closest to me. Is it possible to buy good quality boerewors in Munich? Vienna would be closer. but beggars can't be choosers. Groenwald, the other one I can spell. Any help please? I am looking for my uncle ( my moms brother), Walter Carl Chandler. years, it is very urgent. my new Home in Germany! I am from Cape Town and am living in Karlsruhe for the time being. site, great to know that there are some of you out there. Found this page by accident while surfing Voetsek. Great Surprise. I did not realise that there are so many of us in Germany. craving contact with other South africans. Anybody close to me??? Bit slow though but fun! I tried to get you before. This time you came up fine. would like to learn Afrikaans. I life in munich and I am german. het net so toevallig die lekker bladsy raakgesurf..
i m living in Unterfranken , i was astonished to see such a page here !! to Cape Town which used to cost R1520, will now cost R1700. Johannesburg cheapest fare of R280 will go up to R290. from Johannesburg to New York will go up from R6350 to R6890. from R3 990 to R4670. to Paris from R4620 to R5090. anyone know any South AFricans living in Bremen.......north of Germany. DEAR SPRINGBOK AND RUGBY FANS ! IF YOU ARE INTERESTED TO SUPPORT " DIE MANNE "
CONTACT ME AND YOU GET ALL THE INFORMATIONS. WITH SPECIAL GUESTS LIKE MR NELSON MANDELA !! IF YOU ARE INTERESTED-COME AND SEND A MAIL. GUTEN TAG BAVARIAN SPRINGBOKS ! ERST EINMAL GRATULATION ZUR WEBSITE ! SEHR GUT ! SO ETWAS HAB ICH SCHON LANGE GESUCHT. ETWA 10.000 VO 80.000 FANS NICHT ZUM SIEG GEREICHT. BEGEGNUNGEN MIT DEN DORTIGEN SUPPORTER CLUBS. CHAMPAGNER DINER MIT DEM EHRENGAST-NELSON MANDELA-! MÖGLICHKEIT DIESE KLEINEN ARTIKELS, ALLES GUTE ! AN EINEM DER AKTIVITÄTEN TEILNEHMEN ZU KÖNNEN. got in and if you have any advice on how I could get in. braais wine and sport.Thanks and cheers.Keep it up!!!!! were so many south africans living here, till he told me of the Springboks. be just the one to turn to. Thanks for the message (I am already member - so far not a very active one, though). Anyway, please would you send me the newsletter to my e-mail address rather than fax. Still no date set for the wine-tasting, but keep watching the homepage or join the club and you will be informed. Does anyone know when the next annual wine tasting will take place and if there are still tickets? Hallo Helmut, nun habe ich die Seite endlich gefunden. Sehr schön!!! Congratulations on the great idea of a Springboks club and on an outstanding website !! I am just as proud to carry the BMW and Bavarian flag here as the BMW dealer for Pretoria and Centurion. May your club grow to thousands of members and enjoy our good wine, food and beautifull country as much as we enjoy yours ! Kind regards Leo Haese. Sehr schön Helmut, weiter so! Does anyone know where you can get British tea, PG Tips etc. in Munich now that both British shops in Schellingstr. and Knorrstr. have closed down?? Congratulations on a new website. We are both hoping to get to the braai, from Ingolstadt this year, and meet some fellow South Africans. Keep up the good work in Munnich. Just to let you know that the South African water polo team will be playing in an international tournament at the Olympic swimming station between August 3rd and August 8th. I haven't managed to find out on how to obtain tickets, but keep trying. If anyone is interested I am sure they would be only to glad to have some supporters that cheer and shout for them here in Munich. Hi there from a 'migrated springbok" in North America. Good luck with the web site. Hi Helmut;Algonda and my cousin Karen. How are you all, fine I hope!! All's fine over here. The webmaster and his wife have been giving me a very hard time because although I have followed this page since its birth and even prenatally, I have never written in the guest book. Well now I have, and I want to take this opportunity to thank all club members for their efforts in making the club the success it is - see Helmut's great last (3) events and to Helmut himself for keeping this a living and vibrant homepage. To all those "hits" (like myself previously) who are not yet members why not give it a try?? Hope to see you all at the braai in July!! Hello (SA related) world, not just for coincidence but the purpose of being updated I visited this homepage regular, seeing it develop. My congratulations for the special collection of South African specifics. My personal relationship to the webmaster, his family and their deeply rooted bond to South Africa gave me the chance to experience this country, its beauty and hospitality. Thanks for this chance to extend my individual horizon. Dear Bavarian Springboks, we love the new website, and we think it is a wonderful idea to use this new cybermedium to make contact with all the Safricans out there in the diaspora. We hope that a lot of interesting people will use the guestbook to get to know other Safricans. Lots of luck!